“When we first saw the Windows 10 upgrade experience that strips users of their choice by effectively overriding existing user preferences for the Web browser and other apps, we reached out to your team to discuss this issue,” Beard writes. “Unfortunately, it didn’t result in any meaningful progress, hence this letter. 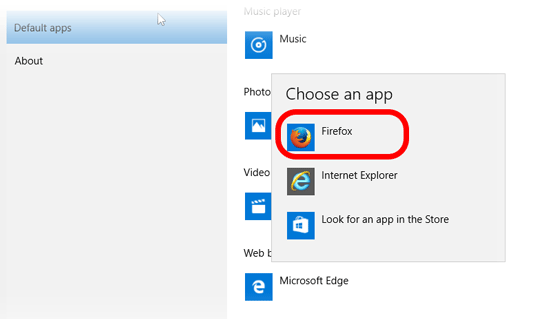 To once again make Chrome or Firefox your default, you have to open your browser of choice and go through a few steps to tell Windows 10 about your choice. You can’t just click “Use Firefox as my default browser” and that’s that. All that button will do is open up the Windows 10 default settings. For non-technical users, the procedure isn’t exactly self-explanatory. “While it is technically possible for people to preserve their previous settings and defaults, the design of the new Windows 10 upgrade experience and user interface does not make this obvious nor easy,” Beard writes. So to help users restore their defaults after upgrading to Windows 10, Mozilla has put together a step-by-step tutorial and video (which isn’t riveting but does the trick). Mozilla, though, it’s worth noting, also had a few issues lately. Its users were neither happy with its switch to Yahoo as the default search engine, nor with the integration of a WebRTC-based video chat tool and Pocket.